A wind advisory kicks in at 7:00 tonight and continues through Wednesday afternoon for the Roanoke Valley and areas along and west of the Blue Ridge. The National Weather Service says winds may gust up to 55 miles per hour in places, and that could be enough to bring down trees and create power outages. From the National Weather Service: Very strong northwest winds tonight into Wednesday. Areas Affected: Alleghany; Bath; Bland; Botetourt; Carroll; Craig; Floyd; Giles; Montgomery; Pulaski; Roanoke; Rockbridge; Smyth; Tazewell; Wythe. Very strong northwest winds tonight into Wednesday. A strong cold front crosses the region this evening followed by an abrupt increase in northwest winds behind the boundary tonight. The gradient between high pressure to the southwest and deepening low pressure to the north will then keep strong winds going through the day on Wednesday. WIND ADVISORY REMAINS IN EFFECT FROM 7 PM THIS EVENING TO 5 PM EST WEDNESDAY. * Winds…Northwest 15 to 25 mph with gusts to 55 mph. * Timing…Overnight into Wednesday with the strongest winds late tonight into Wednesday morning. * Impacts…Trees may be toppled given the wet soil conditions. Power outages may also occur due to falling trees. * Locations…Mainly along and west of the Blue Ridge. A Wind Advisory is issued when sustained winds are forecast to be 31 to 39 MPH or gusts will range between 46 and 57 MPH. 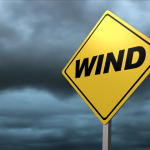 Winds of these magnitudes may cause minor property damage without extra precautions. Motorists in high profile vehicles should use extra caution until the winds subside.